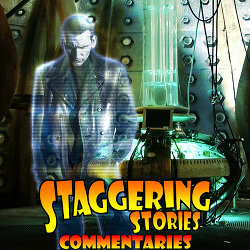 Adam J Purcell, Andy Simpkins and Keith Dunn sit down, fantasticed, in front of the 2005 Doctor Who episode, The Parting of the Ways, and spout our usual nonsense! BBC: Doctor Who – The Parting of the Ways. Wikipedia: Doctor Who – The Parting of the Ways. 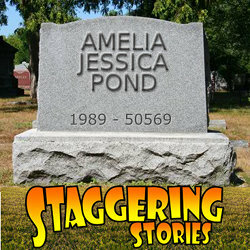 Staggering Stories Podcast #126: Brian’s Alive! 02:27 — Doctor Who: New Who S7 writers and a director named. 03:46 — The Hobbit: Billy Connolly added to cast. 04:37 — Doctor Who: Rory & Fourth Doctor cut-outs and Doctor Who Insider: DEAD! 06:50 — Doctor Who and Star Trek: IDW comic crossover. 09:39 – The SFX Weekender 3 convention and other Welsh excursions. 27:18 – Just a Minute. 38:28 – Being Human: episodes 4.1 and 4.2. 72:20 – Farewell for this podcast! 72:49 — End theme, disclaimer, copyright, etc. YouTube: “I am (not) the doctor” Murray Gold on the piano. 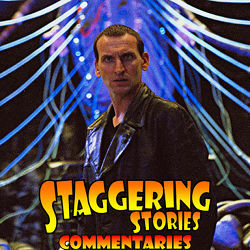 Adam J Purcell, Andy Simpkins and Keith Dunn sit down, big brothered, in front of the 2005 Doctor Who episode, Bad Wolf, and spout our usual nonsense! BBC: Doctor Who – Bad Wolf. Wikipedia: Doctor Who – Bad Wolf. 01:26 — Doctor Who and Merlin: Awards awarded. 03:09 — RTD: SJA replacement – Aliens vs Wizards. 05:11 —– Minister of Chance: Now free! 05:21 —– Being Human: Back on UK TV on Sunday 5th February 2012. 05:43 —– Doctor Who: New novel ‘Dark Horizons’. 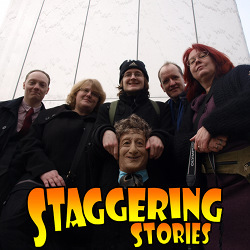 06:33 —– Douglas Adams: Virtual 60th birthday party event. 06:53 —– Star Wars: Uncut fan recreation in 15 second segments. 07:38 – Things in Five Words. 12:55 – Doctor Who: After Amy. 25:22 – Doctor Who: Destination: Nerva. 35:19 – Things in Five Words. 70:48 – Farewell for this podcast! 71:19 — End theme, disclaimer, copyright, etc. Big Finish: Sherlock Holmes Range. Lit2Go: Free Sherlock Holmes Audiobooks.